The National Museum of Nepal was among the monuments damaged by the devastating earthquake in 2015. 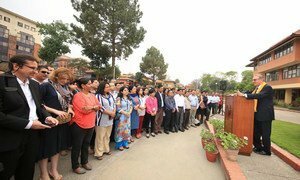 More than a year since the devastating earthquakes that struck Nepal in April and May 2015, through the combined work of the United Nations cultural agency and its partners, some of the country’s notable museums and institutions, including the National Museum, and the National Art Gallery are once again open and visitors are coming back to enjoy their rich collections. “The rehabilitation of Nepal’s museums and historical buildings following the 2015 earthquake has a deep, positive impact on the economic and social development of the country,” said Christian Manhart, Director of the UN Educational, Scientific and Cultural Organization (UNESCO) Kathmandu Office in a news release issued last week by the agency. “There is a tremendous sense of identity, determination and hope that comes with the reopening of museums and the restoration of temples,” he added. The Patan Museum and the Panauti Museum are also re-opening. The earthquake and series of aftershocks killed more than 8,700 people, injured more than 22,000, and destroyed or damaged more than 250,000 houses. The disaster also badly affected the landlocked country’s cultural and natural heritage: 691 historic buildings in 16 districts were damaged, of which 131 fully collapsed. In the months after the earthquake, UNESCO joined the country’s Department of Archaeology in salvaging, inventorying and ensuring the safe-storage of artefacts and other architectural features in several impacted sites and museums including the capital’s Hanumandhoka, Swayambhu and Chhauni National Museum. The UN agency also worked to ensure that local museum staff were trained in earthquake recovery, safe storage and access of museum collections. For instance, in February this year, in collaboration with its partners, UNESCO organized workshops that trained staff from museums in the capital, Kathmandu, and other cities including Pokhara, Kapilvastu, Nuwakot and Dhangadi on sustainable collection and storage, surface cleaning, stabilization, labelling and packing of museum objects, participants gained technical, scientific and practical skills to save collections. Further, a storage facility funded by the agency was also set-up as part of the workshops, protecting some 300 displaced objects. A further 2,955 objects are in the process of being assessed, packed and labelled for safe storing. “However, much still remains to be done and other museums have yet to open their doors,” UNESCO said, stressing that the importance of local communities and volunteers in the work cannot be underestimated. “For example, local volunteers have been guarding sites to prevent the looting of objects,” it added.The agency further added that cultural heritage constitutes a source of identity and pride, and its protection is essential for sustainable development and especially for the tourism economy in the country. The future rebuilding program is in great need of support, and UNESCO aims to incorporate means for visitors to see, understand and contribute to the restoration process. Furthermore, rebuilding and conservation work needs to be part of a wider sustainable development strategy. UNESCO also noted that the Post Disaster Needs Assessment for Nepal, which outlines short-term recovery and repair needs as well as long-term restoration and rebuilding plans, has proposed the total restoration of the damaged heritage sites within six years, as indicated in the Post Disaster Restoration Framework. With so much important work still ahead, UNESCO said that it continues to seek support to carry forward initiatives that will ensure Nepal’s museums and monuments return to their pre-earthquake splendour, for all to enjoy. Just three weeks away from the World Humanitarian Summit in Turkey, the United Nations deputy chief today ended a three-day mission to Nepal after meeting with people affected by the 2015 earthquake as well as with senior government officials.